Oceans are changing and they are changing fast. As human activities continue to alter our marine environment it begs us to question what our future oceans will look like and how might the fishery resources we are reliant upon change. Many organisms in the sea have responded negatively to this change, however, we found there is one group of animals that appear to be thriving: cephalopods, otherwise known as squid, cuttlefish, and octopuses. Cephalopods have a unique set of characteristics, such as fast growth, short life spans and extreme life history plasticity (i.e. flexibility) that allow them to adapt rapidly to changing environmental conditions. Our study presents the first evidence that cephalopod populations have increased globally and that environmental change, brought about by human activities, may be giving cephalopods a competitive edge in the marine food web. Giant Australian cuttlefish come together to breed along a small stretch of rocky coastline in northern Spencer Gulf, South Australia, during the winter months. This represents the only known breeding aggregation of cuttlefish in the world. Following recent declines in abundance of this iconic population, we were interested to see whether this decline was part of a natural oscillating cycle. We hypothesized that if other cephalopods showed oscillating patterns in abundance then perhaps this may suggest that the decline in abundance of the giant Australian cuttlefish was also part of a natural cycle. Using historic data, we assembled a global-scale dataset of cephalopod abundance spanning the years 1953 to 2013. We collated 67 time series of catch rate data (catch data standardized to fishing or survey-sampling effort) that spanned 10 years or more. These data represented all major oceanic regions along with key groups and were sourced from both fishery statistics and scientific research surveys. Once data were collected, we coordinated a group of international researchers to be part of a workshop investigating trends in the data. We used statistical models (generalized additive mixed models) that allowed us to determine whether cephalopods were increasing in a linear or non-linear fashion. Rather than a cyclical pattern in abundance, we found that cephalopod populations have increased over the last six decades. This trend was staggeringly consistent across diverse groups of cephalopods, as well as for both fisheries and survey data. These results suggest that the global proliferation of cephalopods has been driven by large scale processes, common to a range of coastal and oceanic environments and aided by life history characteristics common to all cephalopods. Although drivers of change were not investigated in our study, plausible causes of the increases include climate change, especially ocean warming (provided there is sufficient food and thermal limits of the cephalopod is not exceeded) as elevated temperatures may accelerate their life cycles. 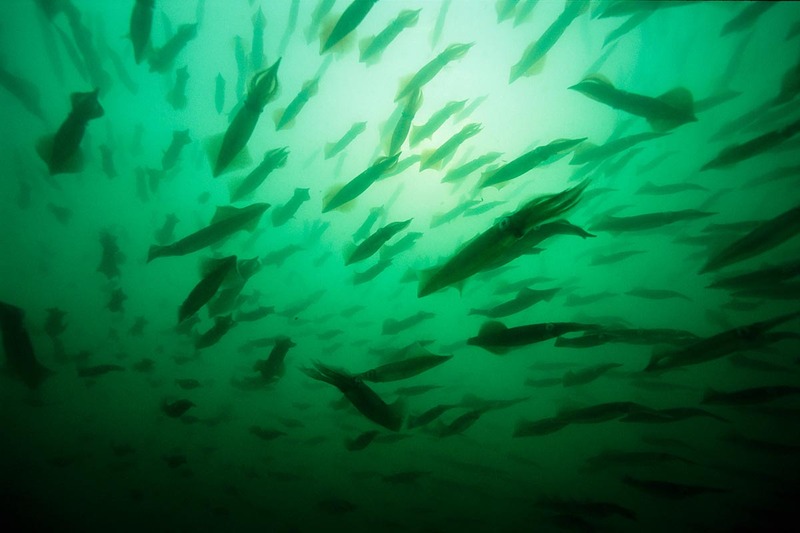 An alternative (or additive) driver may be overfishing and the gradual, global depletion of fish stocks; fish both compete with and prey upon cephalopods. A range of other environmental factors such as climate cycles and eutrophication, as well as habitat modification, may also give a competitive advantage to cephalopods over longer-lived, slower growing marine species such as fish. Since we commenced this study, there is also good news for giant Australian cuttlefish! The numbers on the breeding aggregation increased in both 2014 and 2015. While it is a little early for abundance estimates for 2016, this year also looks promising. Increases in cephalopod abundance have implications for both the marine food web and us. Cephalopods are a large and diverse group of animals that inhabit all marine habitats. They are voracious and adaptable predators, an important source of food for many marine species (e.g. marine mammals, fish, seabirds), and support many important commercial and subsistence fisheries around the world. This research has captured the world’s attention, featured in over 100 news outlets including high profile mainstream news such as The New York Times (print and online). In Australia, the research was showcased on ABC News 24 via a 7-minute interview. This science has traversed many language barriers and has permeated pop culture, even earning a mention in the satirical American news outlet, The Onion. The research has featured in major scientific news outlets including Science Magazine, Nature, Scientific American and a long piece by renowned science journalist, Ed Yong in the The Atlantic. The paper has reached viral status on social media with an estimated reach of ~3.5 million users on Twitter alone. The reach of this paper has been quantified by Altmetric, which tracks online social and traditional media. Two weeks following publication this paper reached the top 0.01% of all research outputs ever tracked by Altmetric (>5 million) and is currently ranked 8th out of all tracked outputs from Current Biology (>5,600). Three weeks post publication, the article has an Altmetric score (>1000) comparable to the top 50 publications for 2015, a remarkable feat given the age of the publication. This data is especially significant given ecological and environmental science research rarely gains such media and public interest. Our research has reached a global audience, and has inspired a level of interest in science, and in particular, environmental and ecological science, which is not often seen. The next step is to determine what is causing an increase in cephalopods; at a global level correlations can be established. Initially we plan to investigate sea surface temperature and commercial fishing. Ideally we would use a measure of ocean warming that was reflective of the temperatures that the cephalopods were exposed to rather than surface temperature, but at present sea surface temperature is the only available proxy of ocean warming at broad spatial and temporal scales. Temperature may effect cephalopods directly or indirectly therefore temporal lags in temperature can also be investigated. We will also seek out fisheries data (catch and effort) for key commercial fish stocks in the various regions to see if fish are declining at a rate similar to the rise of cephalopods. At a regional or ocean basin scale, we could also select a data rich region for more intensive investigation – for example, we could investigate how prey availability has changed over this time period. Cephalopods have high metabolic demands and limited ability to store energy; therefore, prey availability can strongly influence population abundance. We can also expand our cephalopod dataset to include life history traits and examine how life history traits, climate variability and fishing may interact such that some species are more successful than others. In addition, the status of cephalopod stocks in different regions and under different fisheries management controls can be examined further. Such information will improve our ability to manage cephalopod populations and allow a dynamic approach to management if necessary. Our research was published in Current Biology (full citation details below) and is available for free download for 50 days from publication (23 May 2016). Doubleday, Zoe A; Thomas AA Prowse, Alexander Arkhipkin, Graham J Pierce, Jayson Semmens, Michael Steer, Stephen C. Leporati, Silvia Lourenco, Antoni Quetglas, Warwick Sauer and Bronwyn M. Gillanders (2016) Global proliferation of cephalopods. Current Biology 26(10): R406-R407. The research was funded by the Environment Institute, University of Adelaide (grant to BMG). ZAD and BMG led the project and were involved in conceptualization; development of methodology, concepts and paper content; writing, reviewing and editing; project supervision and administration. ZAD was also involved in data collection and curation; and writing the original draft. This research was undertaken in the Gillanders Aquatic Ecology Lab at the University of Adelaide. Very very interesting! Expecting to se final results of the study! Thank you. We're looking forward at undertaking the next step of the story - should be an interesting result! The next steps are the most interesting to me. Why have numbers increased? What drives population growth? And as stated above, should harvesting increase? Very interesting work! Well done! I like to recommend you http://jigsawpuzzlescenter.com/ for jigsaw puzzles play online. Thank you for posting such a great article! I found your website perfect for my needs. http://minionrush.online It contains wonderful and helpful posts. Keep up the good work!